Winter is coming and Saturday 18th and Sunday 19th September, The Snow Centre in Hemel Hempstead celebrates the new season with the Winter Launch Weekend! There will be great discounts and several interesting attractions, including a Snow + Rock demo and a visit from Olympic skier Kwame Nkrumah-Acheampong, nicknamed 'The Snow Leopard'. You can get your snow legs back on the indoor slopes with a Recreational Lift Pass and there will be skiing and snowboarding lessons for all abilities for no more than £15. Experts can take a Level 5 or 6 lesson to sharpen up their skills and learn new tricks. For newbies, this weekend is a great opportunity to have a first lesson from one of our highly qualified instructors. Adult 45 minute Taster Lessons for only £15! Junior 45 minute Taster Lessons for only £12.50! One hour Recreational Lift Passes for only £10! The demo team from Snow + Rock have confirmed they will be on the snow over the weekend, so you can test the latest equipment for 2011 and ask questions. Ideal if you're after a new set of skis or just fancy having a go on something different. Columbia Clothing will have a selection of their new 2011 winter range on show. TUI will also have several reps on site to answer winter holiday questions, give advice on where to go and give discounts on holiday bookings. You can also meet the first Olympic skier from Ghana during the Winter Launch Weekend. Kwame 'The Snow Leopard' will bring the Olympic Torch. With every pass, you will receive a 25% discount voucher for your food bill in The EDGE, to be enjoyed on Saturday 18th and Sunday 19th September 9am - 6pm. So after your time on the snow, come up to The EDGE to enjoy the panoramic views and a bit to eat for less! 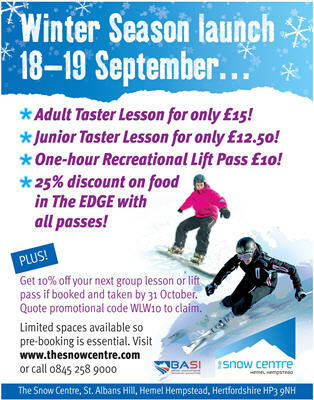 Taking part in the Winter Launch Weekend will give you a further 10% discount on your next Single Group Lesson or Recreational Lift Pass if booked and taken before 31st October. If you book an extra lesson or pass during the weekend on the day itself, you will receive an extra 10% off, giving a total of 20% discount. So it pays to book both days! What are you waiting for? Places are limited so book now by calling our sales team on 0845 258 9000.